Architectural membrane structures offer a reliable solution for maintaining athletic training at the same facility year-round. Once complete, your outdoor pool will function as an indoor pool, at a fraction of the cost of new construction. 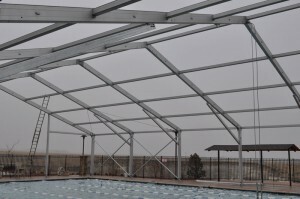 Is the facility already existing or are you building a new Aquatic Facility? The unique benefits of Architectural Membrane Structures are that as your needs change and grow, the structure has the ability to be modified to grow with you. Initial consideration is the budget and R.O.I. making sense. If you envision someday having a permanent facility but cannot budget the additional expense currently, designing the structure to accommodate the necessary additions such as insulation, HVAC (dehumidification), brick and glass walls …. Etc. 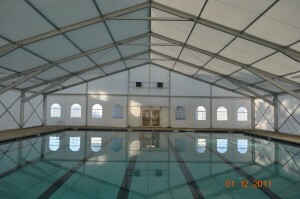 is the way to ensure that when you are ready to expand, the building is ready! Then as your budget allows for additions, you are not burdened with re-purchasing a new building.